Leave every hope, cherries who enter (in my place). I think the sun must have gone to my head, today I feel like a little dictator. heavy whipping cream 70 gr. Not only a dictator, but even fundamentalist. 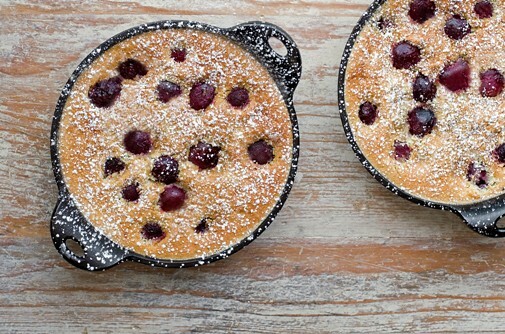 There are a million of clafoutis recipes, the variations are as many as the stars in the sky, but one thing is certain. Purists say that to make clafoutis you must leave the pit to the cherries, because the dessert will have a more intense flavour and it will taste sligthly like almond. And we don't want to make it strange, do we? Wash the cherries and cut the stalk. In a large pan, melt the butter, add the cherries, 50 gr. of sugar, grated lemon peel and a sprinkle of cinnamon. Cook for a little less than 10 minutes, until sugar has dissolved and the juice has thickened. Place cherries on the bottom of a 9-inch round baking pan (or use two smaller ones). Beat the yolks with 3 tablespoons of sugar and vanilla extract until light and fluffy. Add cream, flour and almond flour and mix well. In another bowl, beat egg whites with a pinch of salt until soft peaks form, and gently fold them in the egg-flour mixture. Pour the batter over the cherries and, if necessary, stir it a bit so that cherries won't end up all on the bottom. Bake at 375 for 20-25 minutes, until the surface turns a golden color. Let it cool slightly and dust with powdered sugar. NoA: I recommend you remember telling your friends that the cherries still have the pit!